Stress is an issue that has come up with a lot of my clients lately. Whether it’s causing obvious symptoms like sleep disruption and weight gain or internal issues with the digestive and nervous systems – it can take a toll on us if we don’t manage it properly. It is really important to understand stress, how are body reacts to it, and the harmful long-term effects it causes. Let’s face it – with everything going on in our lives it is hard not to experience stress in some form. Even if we aren’t physically or emotionally feeling stressed, our bodies may be experiencing it internally. I wanted to touch on nutrients that are crucial for reversing the bad effects stress has and also explain a little what is actually happening when we experience it. When the body is under stress, vitamins and minerals are quickly utilized to try and achieve balance within. Overtime this causes us to be depleted of crucial vitamins needed to function, specifically magnesium, potassium, and calcium. 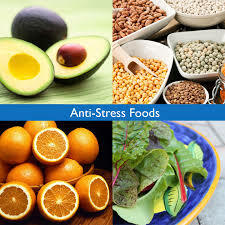 Zinc, omega-3 fatty acids, and proteins are also used more rapidly during the stress response. It is important that we eat foods rich in these vitamins and minerals to help our body cope with and also eliminate excess stress and avoid the harmful long term effects of stress (weight gain, cardiovascular disease, diabetes). B Vitamins are also crucial for our bodies to both deal with and prevent feelings of stress and anxiety. They help support the nervous system and are used at a higher rate during periods of stress. Vitamins A and E are great antioxidants that protect the body against free radical damage, which stress increases. A high amount of antioxidants in our diet can help the body better manage in high stress situations. By incorporating the proper foods, we can help our body to manage stress, which will also help with digestive issues, heart disease, anxiety, and weight gain (our bodies hold on to food and store as fat, specifically shown in the mid-section when stressed). There are a wide variety of foods that contain therapeutic benefits which help to keep stress levels at a minimum. As I mentioned, when the human body is experiencing high levels of stress, the adrenals are producing too much cortisol and adrenaline. During this process crucial vitamins and minerals are depleted from the body, along with other negative physiological side effects. It is important to make sure there are sufficient amounts of potassium, calcium and magnesium in the foods we eat, to not only replenish but also to maintain an adequate amount for when we experience stress. Protein, vegetables, healthy fats and fruits are the most important food categories needed in a diet to enhance mood and eliminate stress. Also, complex carbohydrates are beneficial due to the slow absorption of sugar into our blood and the release of the hormone serotonin. Protein is crucial in maintaining and building neurotransmitters, which are located in the brain and send out positive feelings. The neurotransmitters can only be made out of a few of the twenty-two amino acids. It is recommended that a person has 20-30 grams of protein in each meal. Out of all proteins, fish is considered one of the best sources. This is because most contain all twenty-two amino acids, are easy to digest, and contain many crucial vitamins. It is important to eat a lot of fatty fish, nuts and seeds that contain Omega 3 fatty acids , which suppress the cortisol and adrenaline levels. Fish also contain minerals such as calcium, magnesium and potassium, which are all lost during times of high-stress. I try and incorporate fish often because of the high amounts of EPA and DHA combined, which is not found in plant sources of Omega 3 (where ALA is more apparent). However, in both plant and marine sources, omega 3s play a significant role in reducing stress. The fatty acid is extremely supportive in a healthy cardiovascular system, has cancer-fighting properties, and supports the immune system. Stress also causes our bodies to become too acidic. A diet high in alkalinizing vegetables and fruits will help maintain balance and keep the body at optimal functioning level. Many vitamins and minerals that are important in fighting and correcting stress-induced disease and health issues are found in vegetables and fruits. Vitamin E and C are important antioxidants needed to combat the possible diseases brought on by stress, such as cardiovascular disease, high blood pressure and a hindered immune system. B vitamins are essential in fighting stress, they also help convert L-tryptophan to serotonin “the feel good hormone.” A biochemical effect of stress is a depleted stock of serotonin, the hormone that makes you feel relaxed and in control. Another way to boost serotonin levels is to increase your intake of complex carbohydrates. Great examples of complex carbohydrates are quinoa, millet, amaranth, oatmeal and barley. The slower your body absorbs carbohydrates, the more steadily the flow of serotonin. Folic acid (helps to stabilize mood) and zinc are important to reduce stress. Coconut oil is an amazing superfood filled with so many health benefits and nutrients. It contains antioxidants, helps to absorb nutrients and vitamins, has antimicrobial, antibacterial, and antifungal properties, (which are attributed to the laric, capric, and caprylic acid specific to coconut oil). It is made up of mostly Medium Chain Fatty Acids (MCFAs), which unlike Long Chain Fatty Acids, are sent straight to the liver for energy production. It also kills candida growth, helps with hypothyroidism, and helps speed metabolism. Diets high in MCFAs are known to improve glucose tolerance and reduce body fat accumulation when compared to diets high in LCFs. 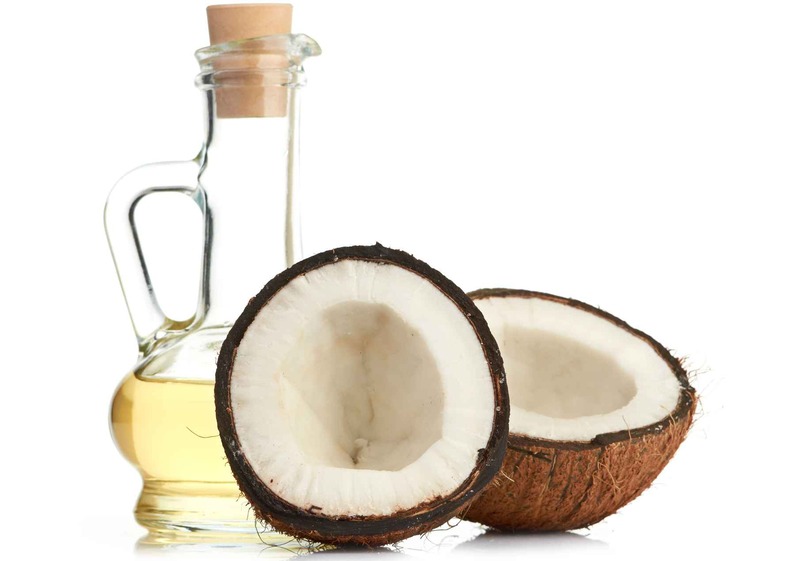 Although it is high in saturated fat, the lauric acid found in coconut oil allows for it to not raise the LDL (bad) cholesterol levels and is actually known to improve heart health. It is important to look for unrefined, pure, and/or virgin coconut oil when purchasing. This maintains the integrity of the oil, allowing you to gain all of the benefits the natural oil has to offer. Coconut oil is also great to cook with,as it is not damaged by high heat levels (as olive oil and other medium heat oils can be). You will find coconut oil is solid in room temperature, however it is easily blended when added to a smoothie. Note: it is important to make sure you add a healthy fat to your smoothies, to properly absorb all of the benefits of the veggies and fruits added. Coconut oil also gives smoothies a nice creamy texture and a subtle tropical taste. It’s a smoothie superfood staple in our household, I highly recommend it for everyone!